Are you considering other investments? Withdrawals are subject to 90 days' notice only; no earlier access allowed. Interest is paid annually. Withdrawals are subject to 35 days' notice only; no earlier access is allowed. Interest is paid annually or monthly. Withdrawals are subject to 90 days' notice only, no earlier access is allowed. Interest is paid monthly. In order to open this account, you are required to open an International Payments Account. This is used to fund the account and transfer monies. Please note; deposits held with Moneycorp Bank are covered up to the value of €100,000 by the Gibraltar Deposit Guarantee Scheme (GDGS), which is the equivalent of the UK Financial Services Compensation Scheme (FSCS). For more information on this, please call one of our advisers. Withdrawals are subject to 90 days' notice only; no earlier access is allowed. Interest is paid on the 31st of December each year. Withdrawals are subject to 60 days' notice only; no earlier access is allowed. Interest is paid on the 30th of June each year. Receive our genuine best buy tables, delivered direct to your inbox for FREE. Genuine best buys selected from the best available, not by commercial arrangement! 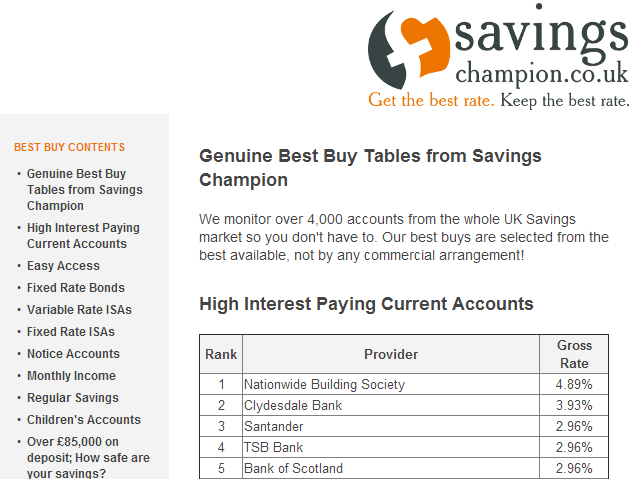 "I use the best buy tables from www.savingschampion.co.uk which does not promote products on the basis of commission or commercial deals and has a genuinely helpful free helpline answered by experts – if you have more than £100,000 it will even manage it for you to get the best rates for a small fee." WHERE SHOULD WE EMAIL YOUR BEST BUY TABLES? We respect you and your privacy, we will never send you spam and you can unsubscribe at any time.